We are your source for different and unique Medieval and Renaissance hats and headwear. Here you will find headwear of Medieval, Renaissance, Celtic and Fairytale designs. We have medieval crowns for the Kings and Queens, tiara crowns for the princesses and hats for the nobleman and peasants. Our medieval tiara are made of sterling silver and are a great accessory for that renaissance costume. 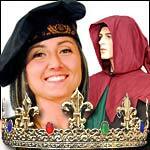 We have many styles of medieval and renaissance hats such as cavalier hats, muffin hats, snoods and berets. Men's medieval crowns are gold plated and encrusted with sparkling jewels, while the women's crowns are plated in sterling silver and covered in rhinestones. Our medieval tiaras are great for medieval weddings. Our 20th Century Headwear section offers Floppy Hats, Steampunk Hats, Fedoras, Western Hats, Spitfire Caps, Leather Hats, Caliber Hats, Derby Hats, Cowboy Hats, Straw Hats, Fisherman's Hats, Top Hats and More! Enter Here for Hairwear, Hair Vines, and Pins made from Crystals, Pearls, Flowers and Chainmail! Barrettes in all shapes and sizes are now an integral part of today’s trendiest hairstyles. We carry designs for every look, every event and every hair type. Fit for a King! These medieval crowns demand loyalty. We have many styles of Medieval, Renaissance or Celtic hats. Surely you will find the perfect renaissance hat to add to your medieval wardrobe. We have a variety of Medieval and Renaissance Tiaras for your Princess' to choose from. Our tiaras are plated in sterling silver and covered in rhinestones. We have many styles of hats from different eras. Surely you will find the perfect renaissance hat to add to your renaissance wardrobe. Gears, cogs, goggles, sprockets, keys, and other technological features adorn many of these hats, elevating them from the realm of being simply classic to superbly Steampunk.